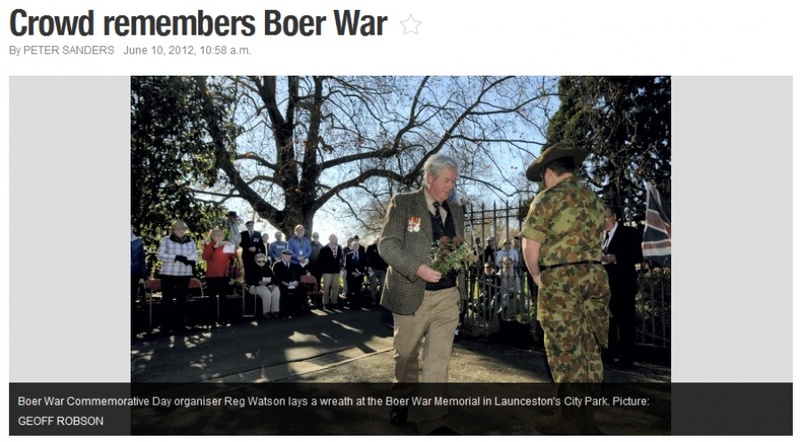 commented on "Crowd remembers Boer War ..."
ABOUT 50 people yesterday attended the 110th anniversary Boer War Commemorative Day service at the Boer War Memorial in Launceston's City Park. Commemorative Day organiser Reg Watson said that the aim of the day was to honour those Tasmanians who served in the Boer War and he was heartened to see descendants of Boer War veterans at the service. The service started in Hobart 10 years ago, with Launceston services added a few years later. ``They're now held across Australia,'' Mr Watson said. ``Tasmania's involvement in the Boer War was quite significant - we went as Tasmanians, as this was before Federation and Launceston played a major role. ``The first Tasmanians went to the war just 14 days after its declaration, the north of the state sent 50 per cent of the 860 men that went from Tasmania, 40 never returned, and it was from Launceston that they sailed. Mr Watson said that the Launceston service attracted similar numbers to that of Hobart. ``Young people seem to be taking more interest in war history, probably because of Anzac and what it means, and my aim is to highlight this forgotten war,'' Mr Watson said. Launceston Mayor Albert van Zetten laid a wreath on behalf of the city, the Launceston RSL City Band played for the service and Australian Army Cadets, A Company, Tasmanian Battalion members formed the guard of honour.